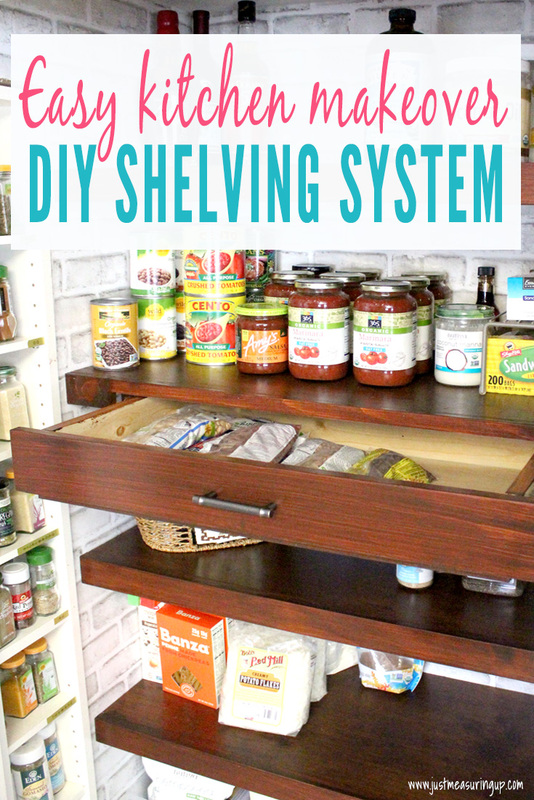 See how you can update your pantry with built in wooden pantry shelves and drawers. 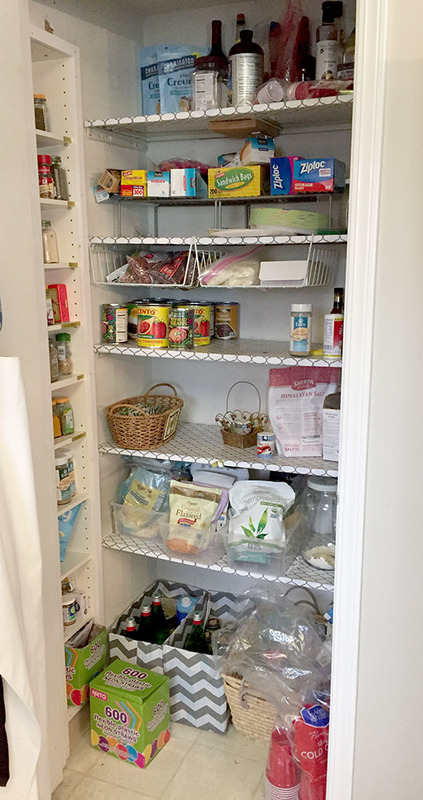 This easy pantry system is a perfect weekend makeover project. It’s time for another round of our At Home DIY challenge, and this month’s theme is home improvement. 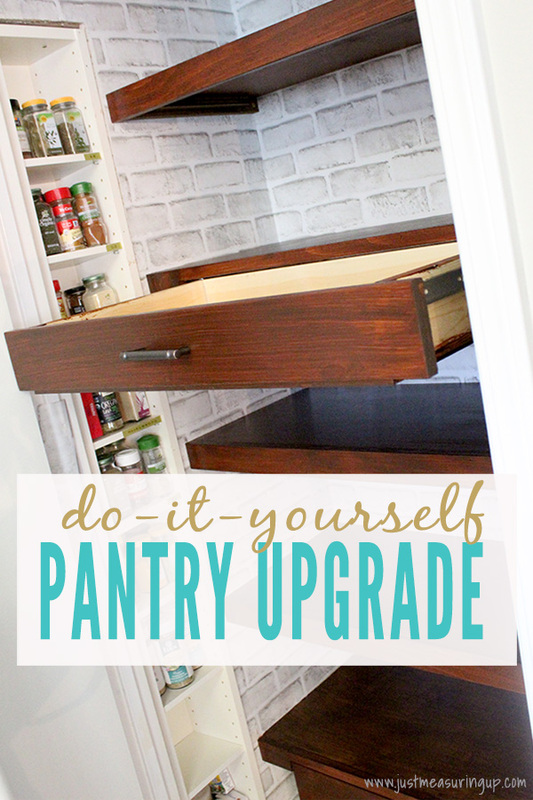 Last month, we redid an old folding TV table, and today we are sharing our pantry update. 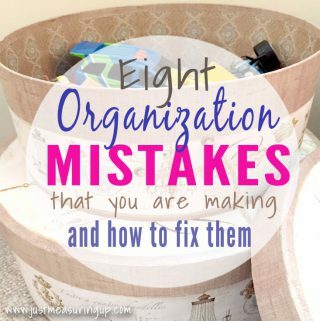 We always look for places in our home that could be easily improved. 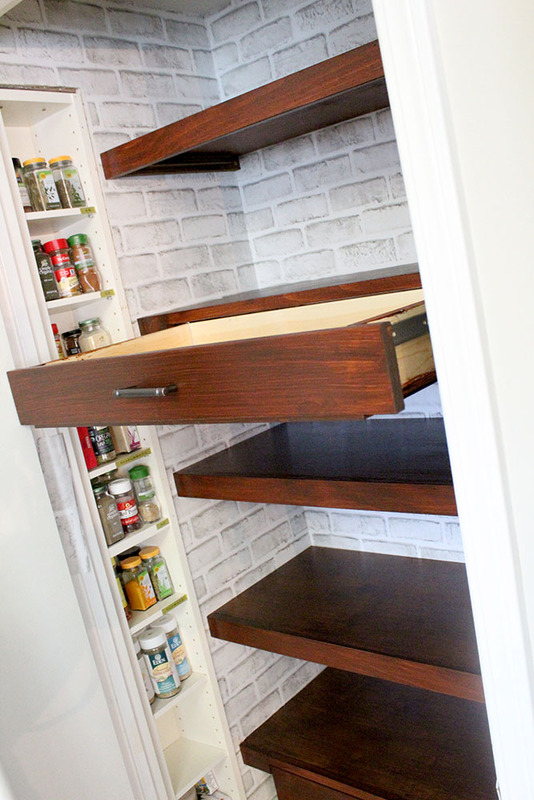 Our pantry was a sight for sore eyes, and now it’s undergone a huge transformation. 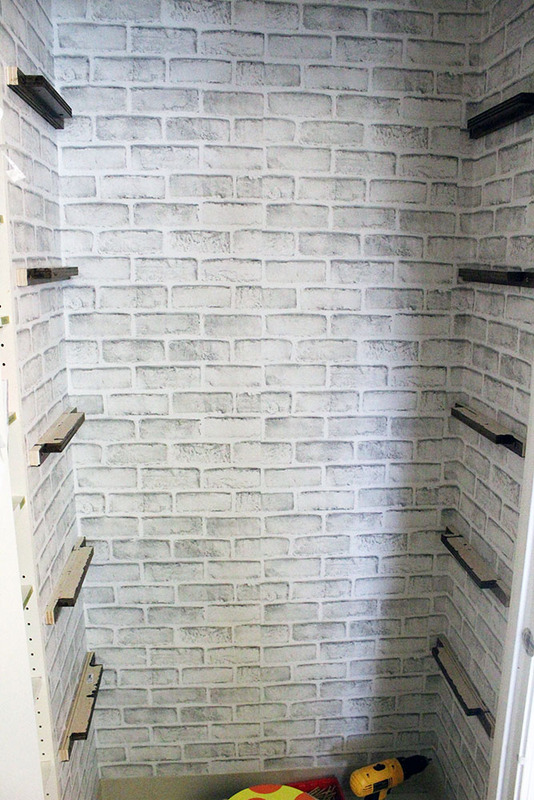 We ripped down the old pantry shelves, covered the beat up wall with brick wallpaper, and installed built-in pantry shelves AND drawers. 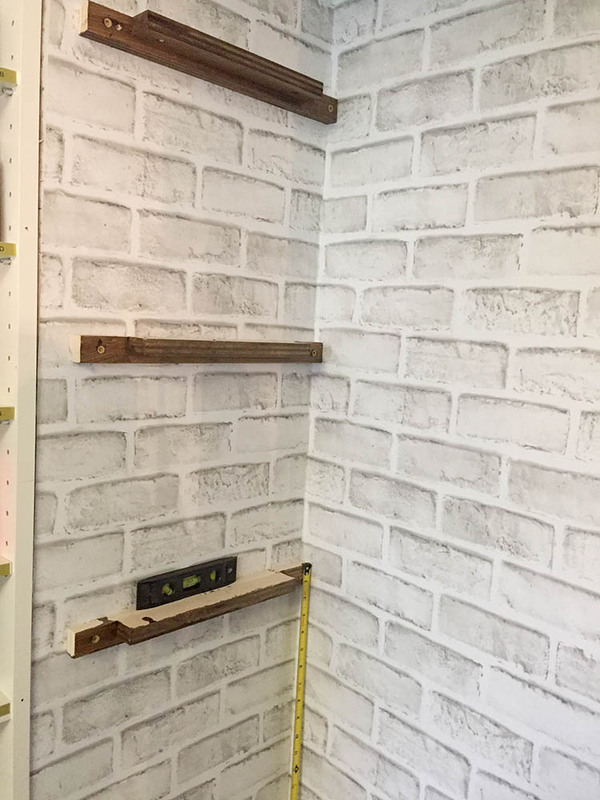 Be sure to check out all of the At Home DIY participants’ projects at the end of the post. We are so pleased with how the pantry looks that we are kicking ourselves for not thinking of it sooner. It only took a weekend of work, I used wood I had, and the add organization is wonderful. It consisted of 5 shelves, two of which held drawers (a smaller upper drawer and a larger bottom drawer). 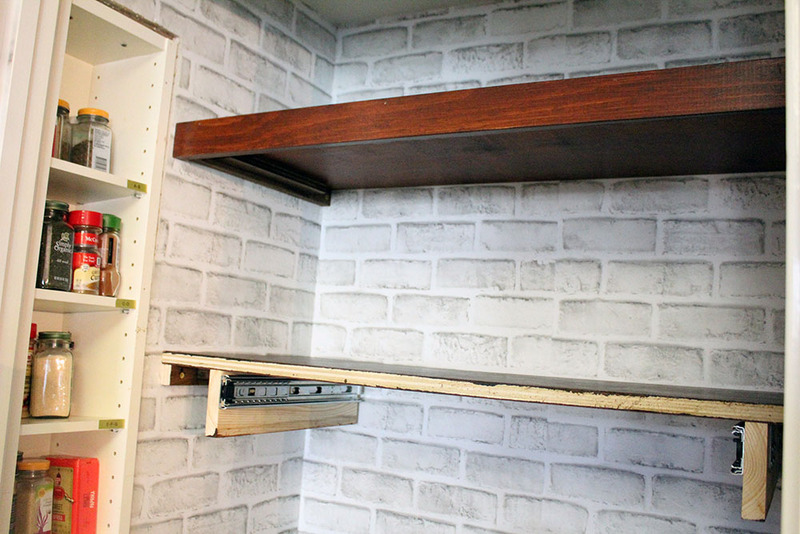 The shelves were made from 3/4″ plywood, covered with a 2″ piece of trim in the front. Before adding our new shelving system, Eileen decided she wanted to do something about the walls. Here are before pictures of the pantry. The shelves were easy to remove, just a matter of unscrewing them. I’ll probably repurpose the shelves in my shed, as part of my much-needed summer shed organization project. Back to the walls, Eileen found a peel and stick wallpaper for cheap with white bricks. So she ripped out the old shelves, cleaned the walls, and applied the peel and stick wallpaper. She wrote a whole post on how to hang peel and stick wallpaper. She goes into all the details, including tips and tricks for wallpaper hanging. After the wallpaper was up (doesn’t it look great?! 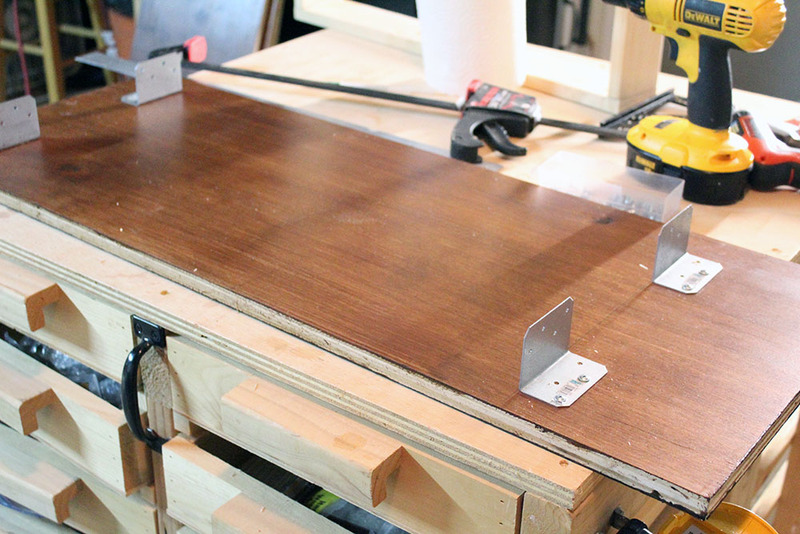 ), I was ready to start making my final measurements and building the wooden pantry shelves. I had a lot of scrap wood left over from a recent mudroom cubby project. So I was able to re-use most of that wood for these pantry shelves. I primarily used 3/4″ birch plywood (for the shelves and mounts) and some strips of 3/4″ pine boards (for the drawers and trim). With the design, materials, and walls ready, it was time to start building the pantry closet shelving. 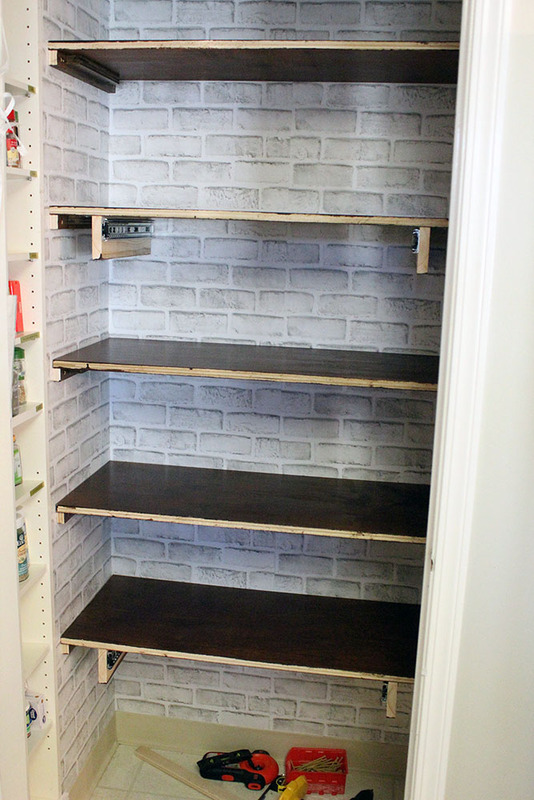 Using several pieces of scrap 2′ x 8′ birch plywood, I cut out 5 pantry shelves (each approximately 37″ x 14.25″). They were custom cut to fit inside our pantry. Even though the pantry closet measured 37″ wide inside, the widths of the shelves were actually just shy of that (about 1/8″ less). I wanted a little leeway when maneuvering the shelves in place. From previous projects in this house, I knew that the walls were rarely perfectly straight. So perfect measurements didn’t always work out as planned. My compact circular saw made quick work out of the cutting. I prefer this mini saw over a regular circular saw when practical. It’s usually a lot easier to setup and maneuver around. 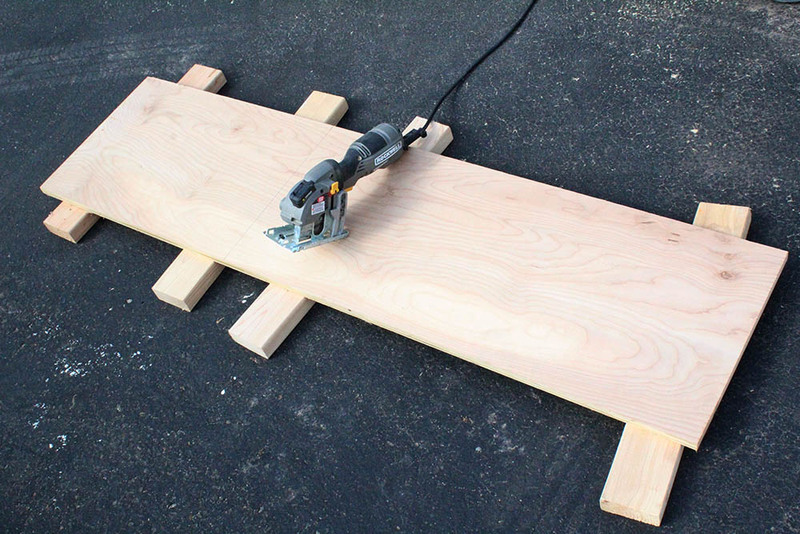 There are lots of ways to to make cross cuts into long 8′ sheets of plywood. I opted to place the sheets on the driveway, raised up on four 2x4s. Properly supporting the sheets on either side of your intended cut is important for ensuring a clean and safe cut. In addition to the compact circular saw for the cross cuts, I also used my table saw to make the lengthwise (rip) cuts to trim the board to 14.25″. After the shelves were cut, next it was time for some custom shelf supports. I needed 10 supports in total (2 per shelf). The supports were to be screwed into wall studs in the pantry, and hold up the shelves. They also needed to be able to hold the shelves in place so they didn’t slide forward. Long deck screws would secure the supports to wall studs, while shorter wood screws ran vertical to kept the shelves in place. Notice how all my holes were pre-drilled with a counter sinking bit. This was to reduce the likelihood of the the wood splitting, especially since I was placing holes so close to the edges. 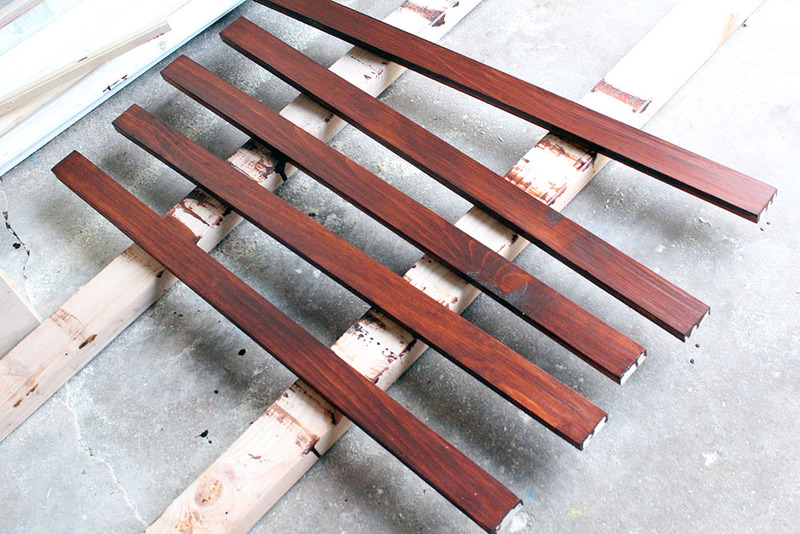 After the shelves and supports were completed, it was time to stain the wood. 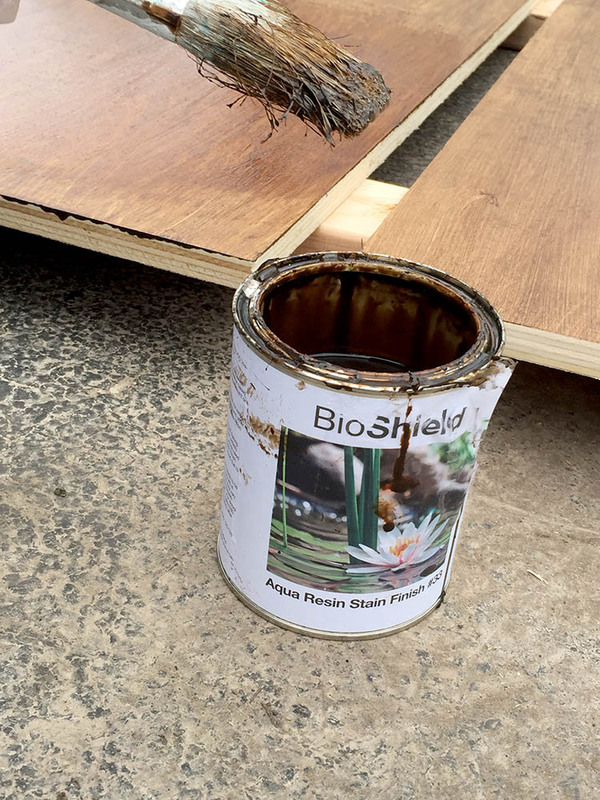 We went with an eco-friendly stain that omitted zero VOCs. We were so pleased with this stain. There was absolutely no odor and it went on easy. I first stained the supports. They would be visible when looking up at the higher shelves, and I didn’t want raw wood to be exposed. Only one coat of stain was really necessary. 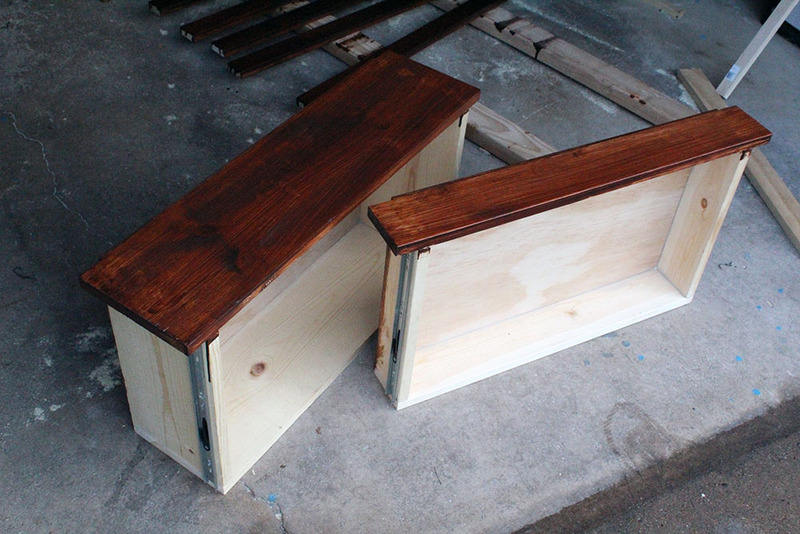 Next I got to work on staining the large shelves. It didn’t take too long. 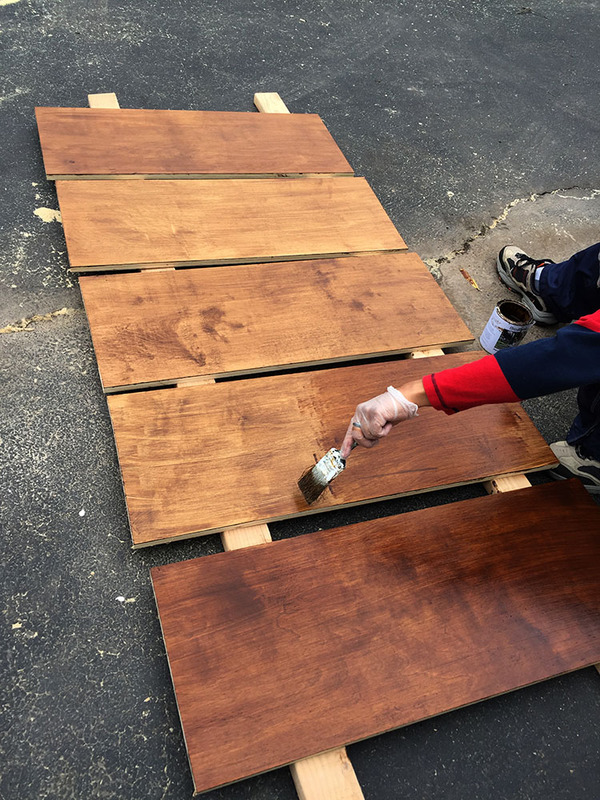 I laid them out in the driveway on some 2x4s, and brushed on the stain. I did two coats on the top side of the shelves, and one coat on the botton. 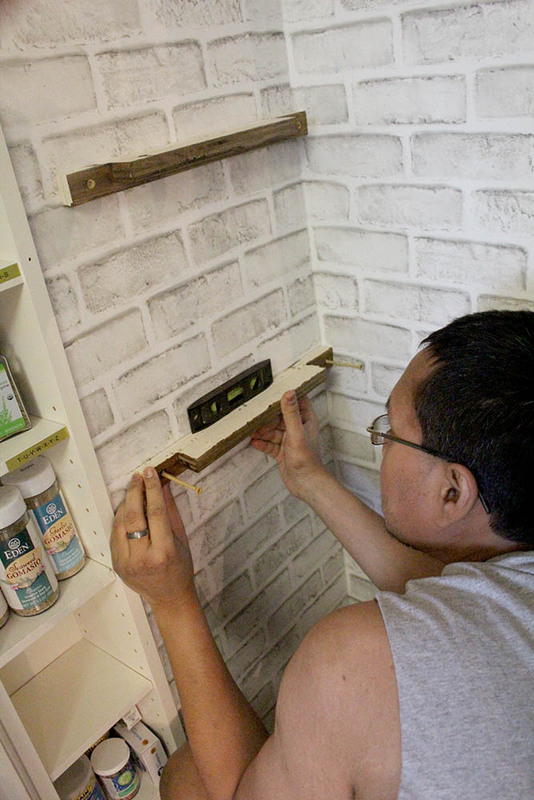 After the stained supports were sufficiently dry, attached them to wall studs in the pantry. I spaced them 12″ apart vertically, starting from the pantry ceiling. After the supports were all installed, I rested a scrap piece of 37″ wood across each support to make sure they were level. Thanks to my laser level and regular level, all the shelf supports were straight. Next it was time to build some pull out drawers. Since these drawers were going to be inside a pantry closet, I needed to make them narrow enough to be able to extend through the doorway. There were going to be two sets of drawers. 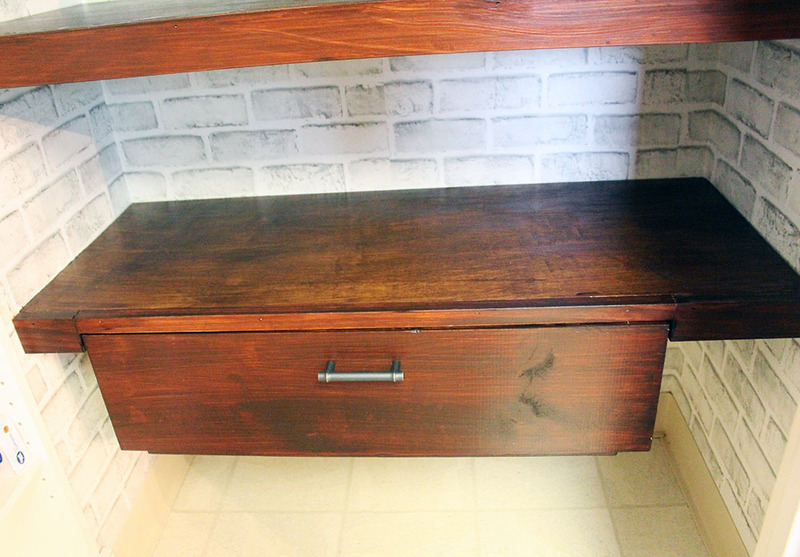 The upper drawer was 3.5″ deep and the bottom drawer was 7.25″ deep. They measured approximately 14″ x 24.25″. 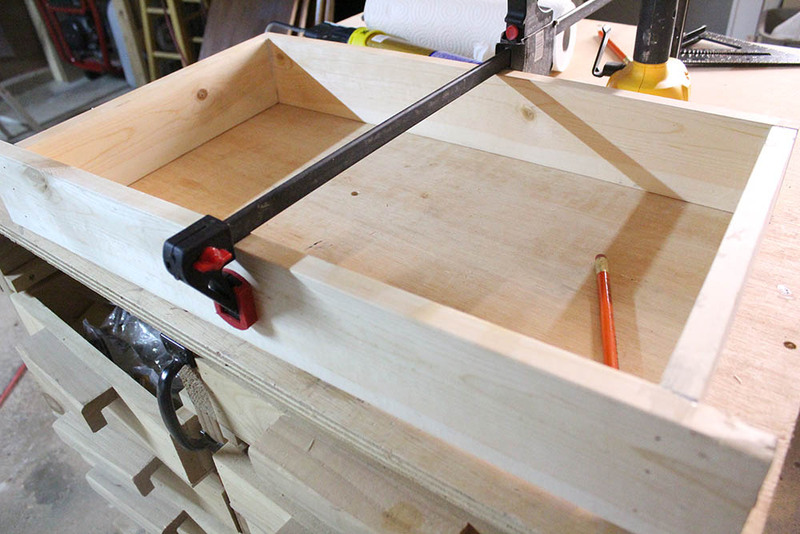 I cut strips of the drawer sides with my miter saw, and joined them to form a rectangular frame using some construction adhesive and my finishing nailer. 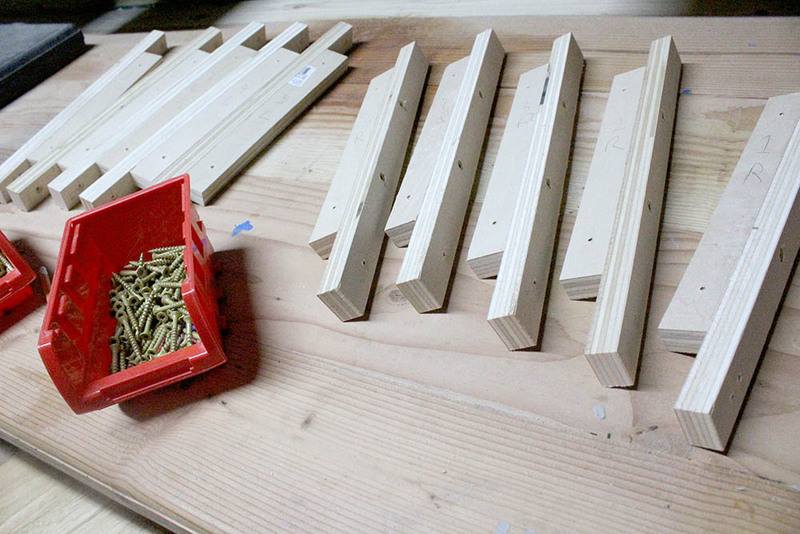 I’ve made so many drawers lately for various projects, and they all revolve around the same basic design. 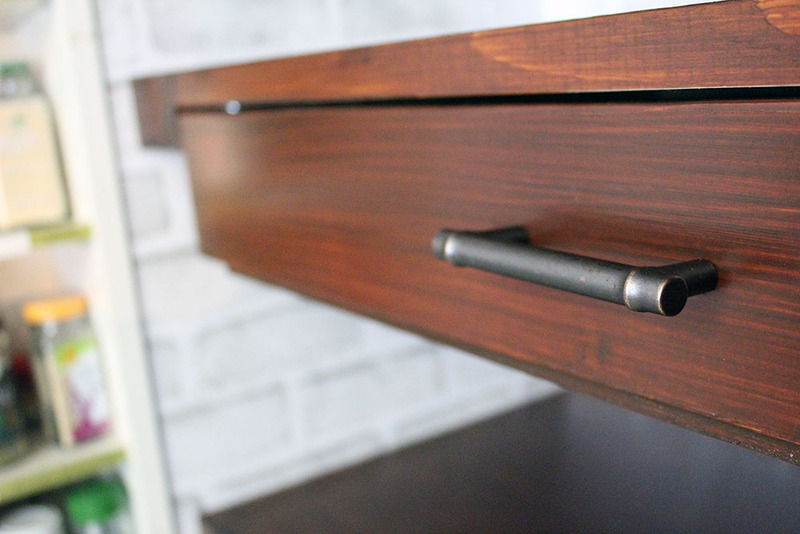 Check out my post about making custom pull-out drawers to learn more. 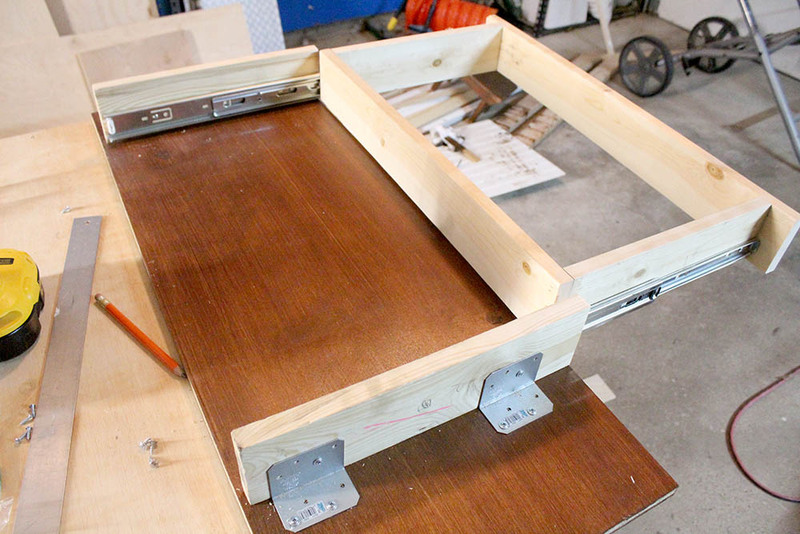 Next, I fabricated a drawer mount underneath two of the shelves. 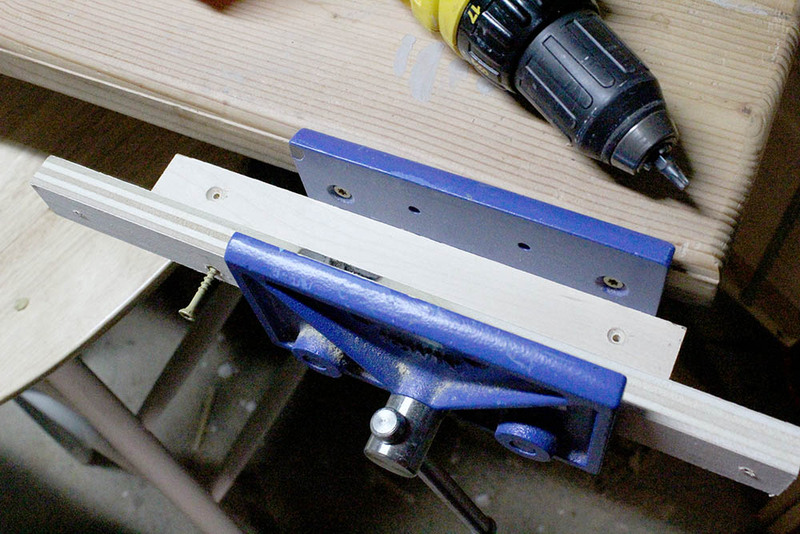 Two pieces of 3/4″ thick wood (14″ long) were attached perpendicular to the shelves using some L brackets. 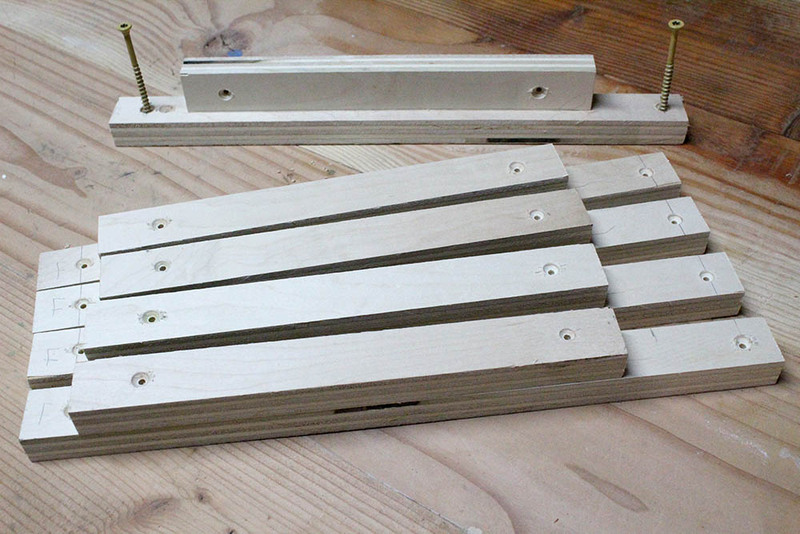 Then 14″ drawer sliders were then attached to these pieces of wood, followed by the actual drawer. The drawer mounts were carefully positioned to allow the drawers to be able to slide out past the pantry door. I later added in two pocket holes in the center of the perpendicular wood support for extra rigidity. 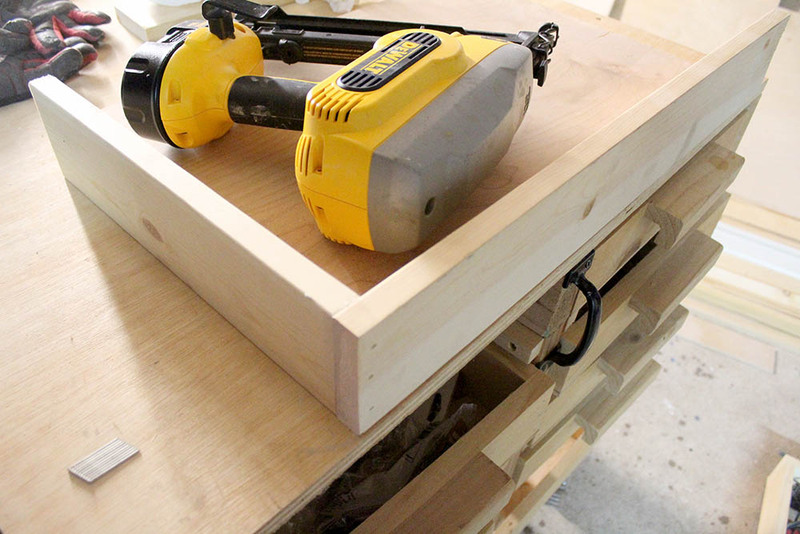 After I was satisfied with the sliding drawers, I cut out 1/4″ plywood bottoms for the drawers and attached them to the drawer with my finishing nailer and more construction adhesive. I found it really convenient to attach the bottoms to the drawers while they were mounted to the upside-down shelves. The mounts ensured that the frame stayed square before the bottoms locked their shape into place. Finally it was time to start mounting the pantry shelves. There was not much wiggle room in the pantry closet, so I found it best to insert the shelves into the supports one by one, starting from the top and moving down. Now it was time to cover up the exposed plywood edges with trim and add to the visual appear of the whole project. Two of the trim boards needed to be cut again to fit around the drawers, but I wanted to do that with the drawers in place to ensure a proper fit. I attached the trim to the shelves with construction adhesive and my finishing nailer. Next I inserted the drawers and proceeded with the trim on those drawer shelves. I took some of the trim used on the other shelves, and cut it into three pieces to wrap around the drawers. The pantry shelves were finally completed! It took a weekend to complete with a budget of around $75. I was able to save by re-using left over wood from previous projects. My expenses were just the wallpaper, eco-friendly stain, drawer slides and handles. 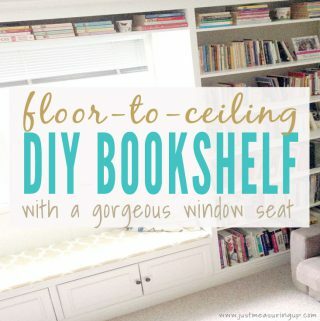 Also, you don’t have to use 3/4″ plywood for the shelves. I personally would have preferred common board, but only used the plywood because I had so much of it. 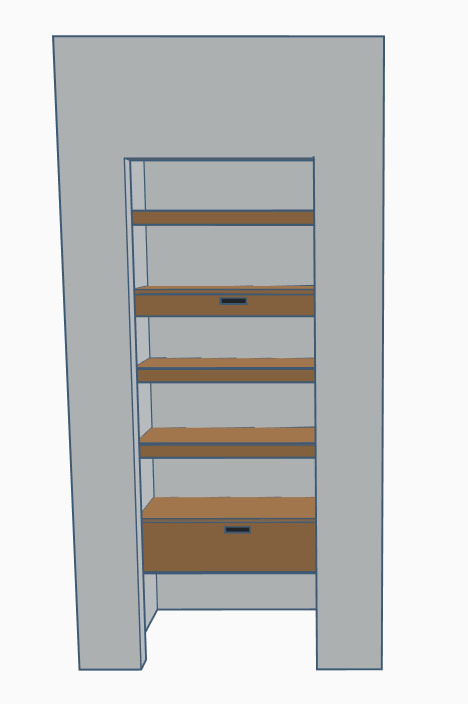 Here are some finished pictures of the pantry closet shelves and drawers. Is there more organization in the pantry now? I’ll let my wife Eileen answer this one – YES! The two drawers hold so many things! The lower one holds all of the snacks and bags of food, which usually make a pantry look a mess. These bagged snacks took up a whole cabinet of space prior. One of the things that was great about Ash’s design was that he used all of the “extra space.” There was wasted space between the last shelf and the bottles of coconut water we would keep on the floor. That wasted space is now a huge pantry drawer. 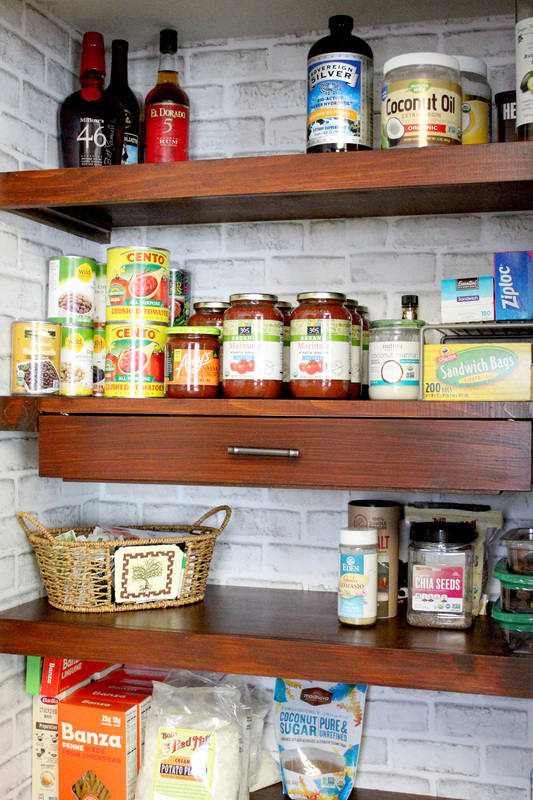 I am absolutely loving pantry – every time I open it, I smile. Isn’t that what DIY is all about?! For $75 and a weekend of time, it was totally worth it. 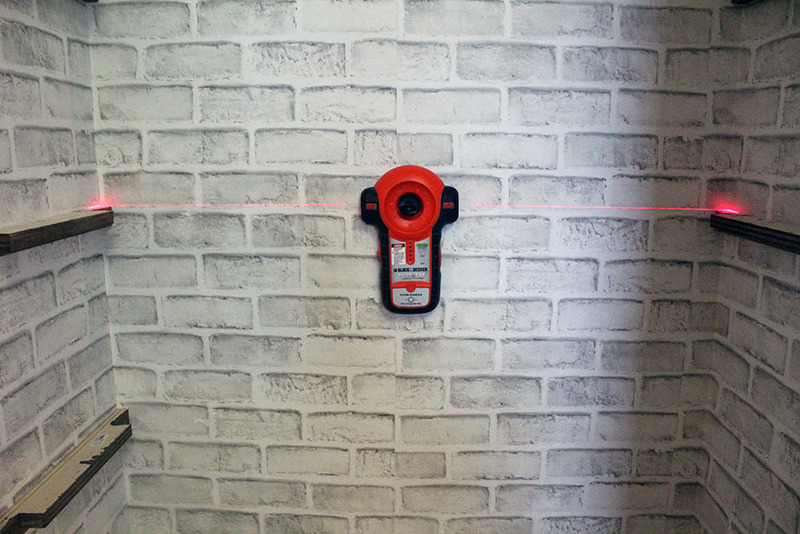 This project was part of our At Home DIY challenges, where we are collaborating with over 30 talented DIY bloggers. 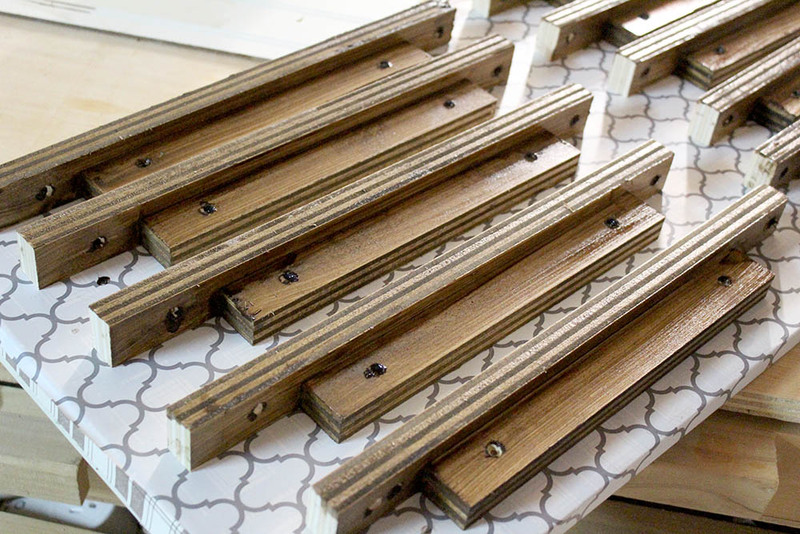 See everyone’s projects from this month – DIY Home Improvement Projects. In our old house, we also redid our pantry! 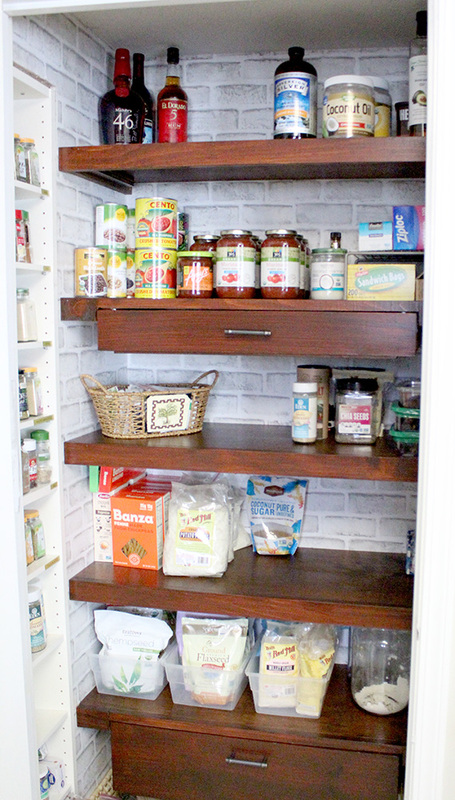 This was an easy pantry makeover with French doors. 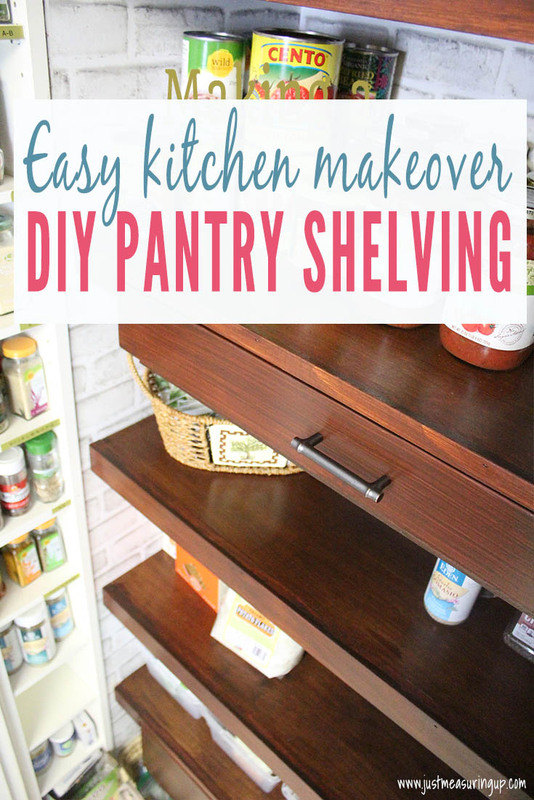 Wondering where that shelving in our pantry came from? It’s a CD tower that was on it’s way to the curb. 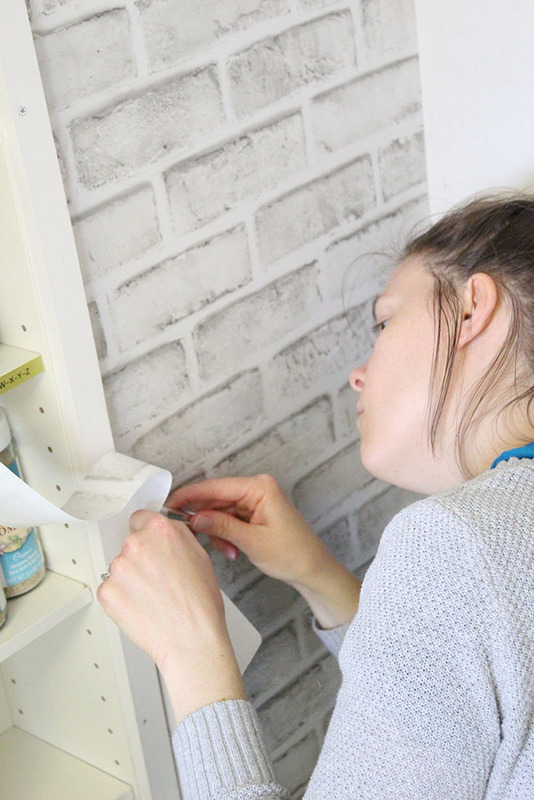 Check out how we upcycled the CD tower into pantry shelving. A few years ago, right before Christmas, Eileen gel stained the kitchen cabinets! The dark color goes great with the walnut pantry shelves. WOW, this looks so much better!! I love that you adding drawers to the shelves to give you more storage. Great job!! Beautiful! 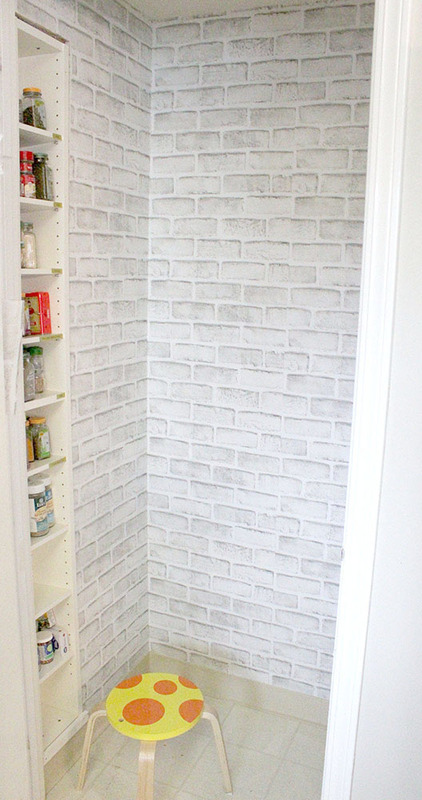 Love the wallpaper and of course your pantry looks Amazing. The pantry looks wonderful!! 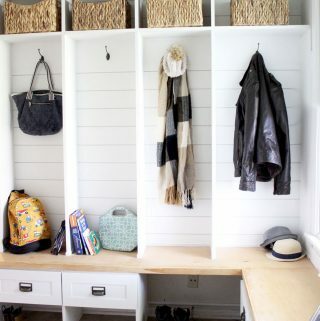 Such a great idea to add drawers to store things too. So useful!! Oh my! I LOVE this! 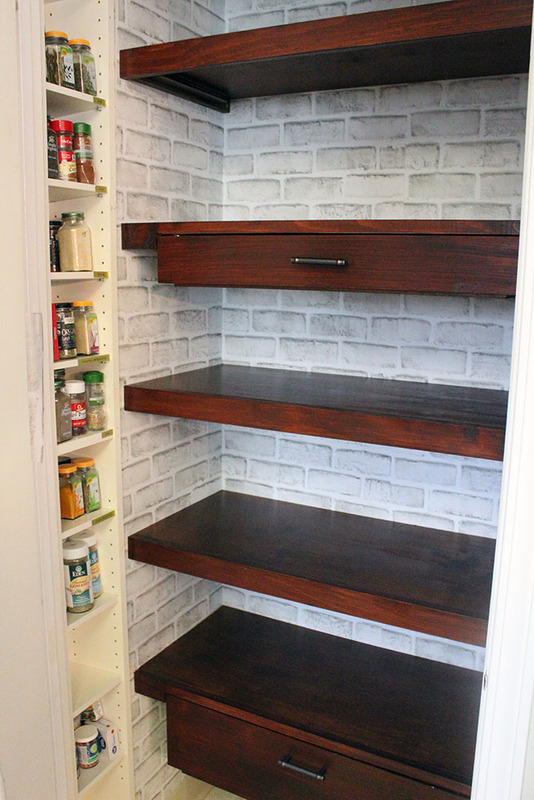 Such a smart and creative idea for a pantry. Thanks for the details, tips and tricks. You made this look so easy and perfect! OMGosh I love it. Wonderful idea to add drawers. 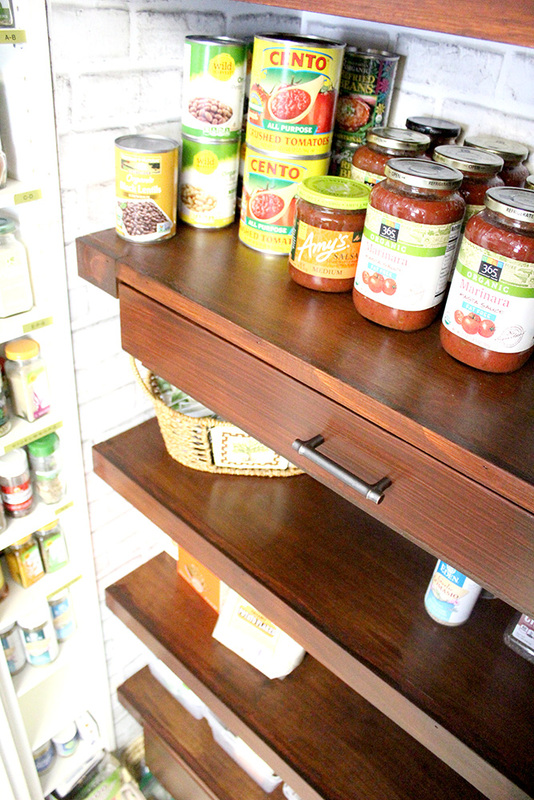 Thanks for sharing your pantry with us. Can I put in an order for my pantry next? I have been putting this project off for so long. I am going to get me one of those laser levels though. That thing would get so much use around here! !